As the saying goes, two is better than one. Flowing jumpsuits and frilly rompers have held reign as the staples of summer, but that title could be snatched up soon. Fashion is making a concerted effort this season with coordinating two-piece sets popping up on racks in every silhouette and style. It takes two to tango; are you ready to dance? Pull out all of the stops on your very first two-piece set. Say adios to plain Jane polyester by emboldening your fashion sense with more dynamic textures. Try a frilly two-piece on for size, like For Love and Lemons scalloped lace Tati dress. If sweet isn’t quite your flavor, why not try spicy? BCBG Max Azria’s crocheted crop top and skirt are made for the boho babe with attitude. Let your femininity blossom in a floral co-ord that fits your cheerful and congenial demeanor. 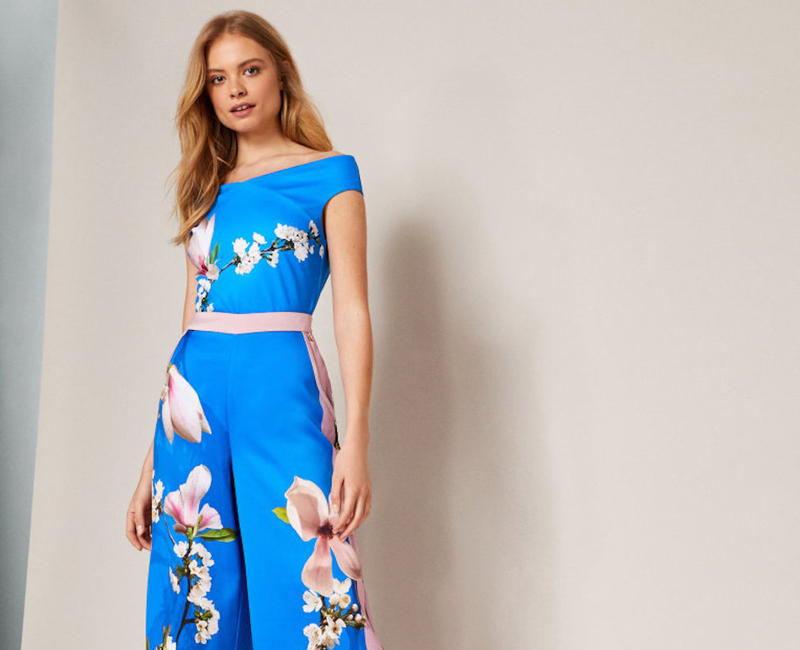 Exaggerated cherry blossoms make a big, blooming statement in Ted Baker’s Harmony ensemble. This chic and sophisticated two-piece is a glow up to summer jumpsuits. For a more sultry look, venture to the dark side with ALI & JAY’s black coordinating split skirt and crop top. Styled sets are not just for boho queens and frilly fashionistas. A two-piece coordinating set can still be tailored, chic and sophisticated. For a polished daytime look, Urban Outfitters’ Amanda linen button-down midi skirt is classy with a hint of playful. 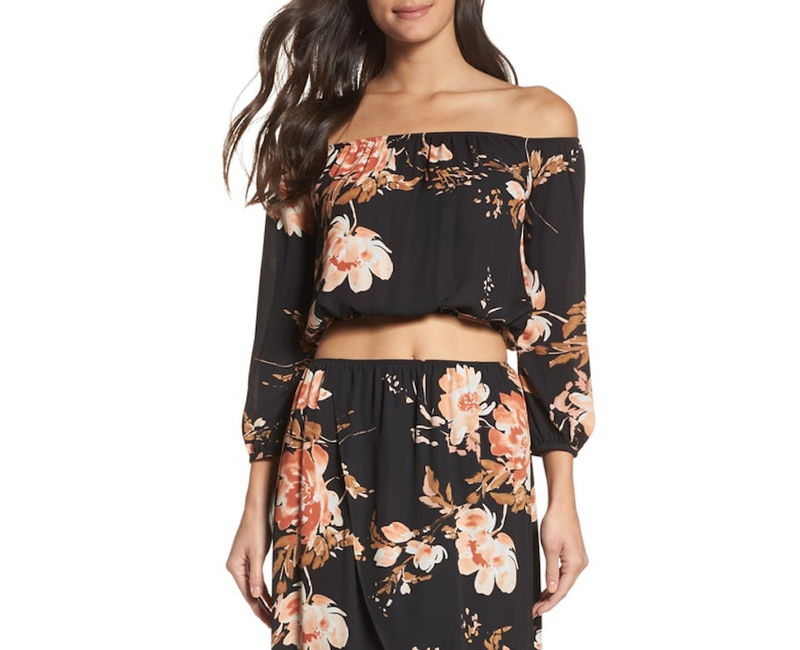 This co-ord is perfect for Sunday strolls and brunch dates. To bring a two-piece set into the workday, consider Topshop to be your ultimate destination. 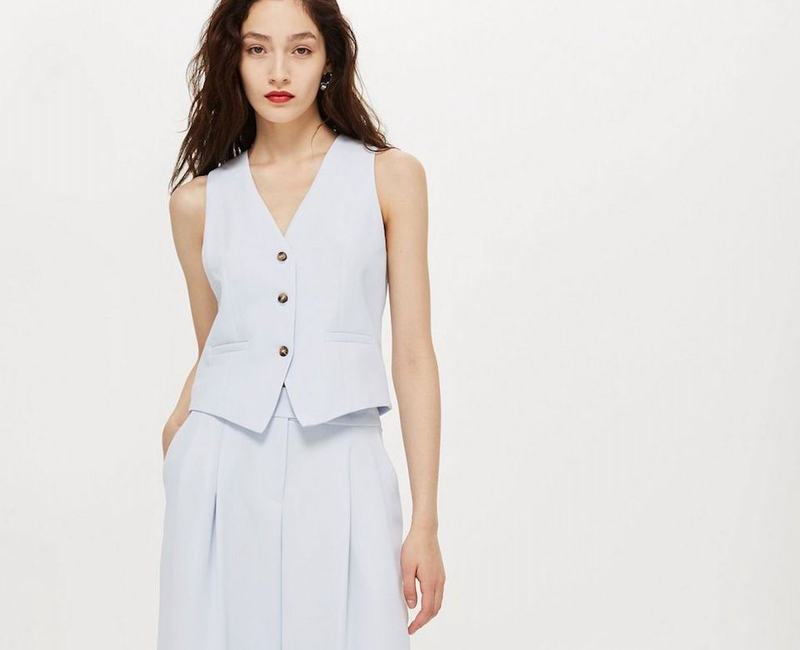 Filled with racks of creative combos and tailored women’s suits, Topshop achieves refined professionalism in its beautiful pale blue waistcoat and trousers set. Step into the boardroom like it’s the Carrousel du Louvre during Paris Fashion Week. Tic-Tac-totally two-piece. Stripes and checks make platinum duets in the wardrobe. Sport a simple, tasteful set like Forever 21’s grid-patterned outfit from day to night. The trendy look features wide-legged pants for comfort and bare shoulders to beat the summer heat. Clandestinely an upscale shopper? 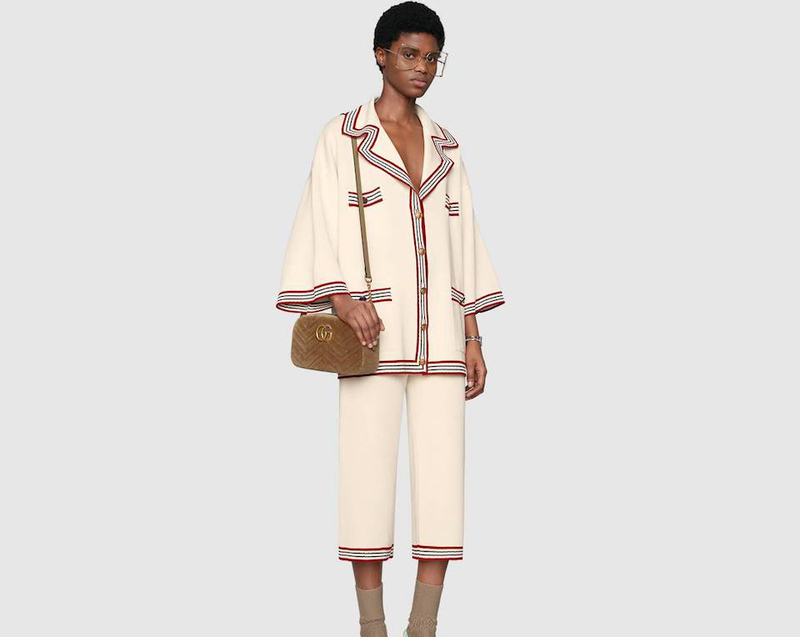 Splurge on Gucci’s silk cotton cardigan, which showcases Gucci’s signature colors in subtle stripes. This hot ticket item is versatile enough to stretch beyond ephemeral months of the summer sun.